On Oct. 9, three West Liberty-Salem FFA chapter members attended the Ag Administration Dinner at The Hive in Mechcanicsburg. Speech topics included FFA impact and OSU Precision Ag. The guest speaker was Trey Colley. From left are Trista Havens, WL-S FFA advisor, Adalyn Caudill, chapter president, Camrin Rice, chapter asst. treasurer, and Alyssa Alford, chapter reporter. 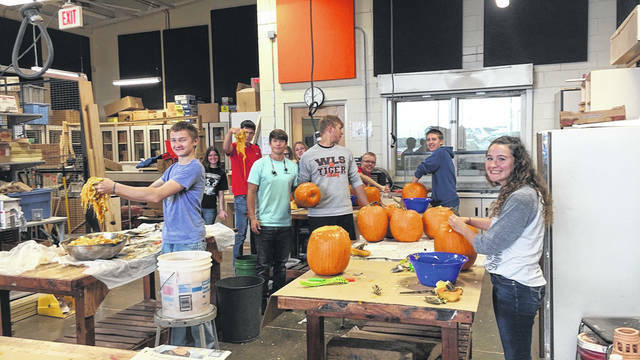 The West Liberty-Salem FFA chapter had pumpkins delivered at the school, then gutted and curved them for Cedar Bog’s October Boo in the Bog. From left are Clay LeVan, Gabby Mahoy, Garett Schoenleben, Trevor Woodruff, Kyle Wolfe, Denver Cushman, Tucker Ridenbaugh and Alyssa Alford. 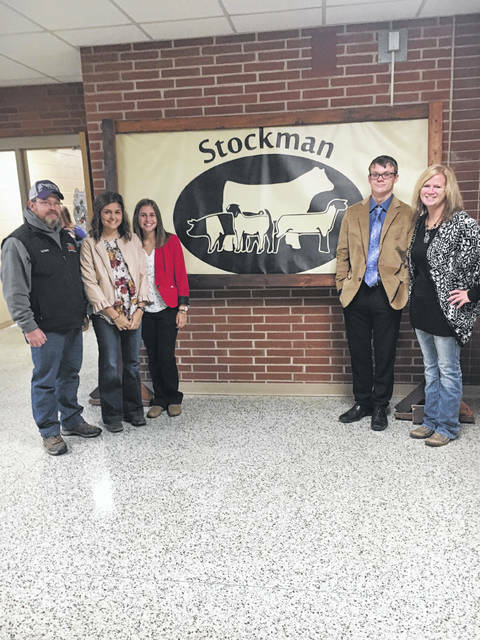 2017-2018 WL-S FFA members Mallary Caudill, Adalyn Caudill and Cooper Havens competed Oct. 20 at the Stockman Livestock Judging Competition in Indiana. 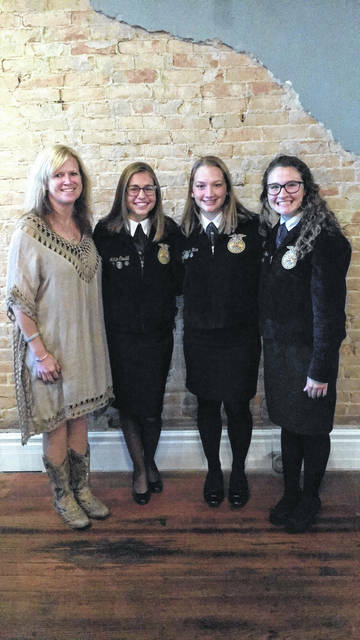 The trio earned a spot in this national competition by finishing eighth in FFA General Livestock Judging in the spring. Mallary Caudill graduated in the spring from West Liberty-Salem High School and now attends The Ohio State University at the Lima branch and is the state FFA Sentinel. Adalyn Caudill is a junior at WL-S, and Cooper Havens is a sophomore. Also pictured are WL-S Livestock Judging team coach Ron Waldron and WL-S FFA Advisor/Coach Trista Havens.